Sn0wbreeze 3.1.3 has been released which can jailbreak iPhone 2G, 3G and iPhone 3GS on the latest iPhone 3.1.3 firmware. One thing which is to be noted here is that it will work with iPhone 3GS only if it has the older bootrom (non-MC model). iPhone 3GS users who have upgraded to the stock 3.1.3 are still out of luck. Follow the simple step by step guide below to jailbreak your iPhone 2G, 3G and iPhone 3GS (old bootrom only) on iPhone firmware 3.1.3 using Sn0wbreeze. This version of Sn0wbreeze is for iPhones only. iPod touch 1G/2G (older non-MC models) can use redsn0w to jailbreak on 3.1.3 firmware. iPod touch 3G is currently not supported. Guides for jailbreaking iPod touch 1G/2G (older non-MC models) can be found here, here or here. Step 3: Download Sn0wbreeze and the original iPhone OS 3.1.3 for your version of iPhone (download links given below). Move all these files to your desktop. 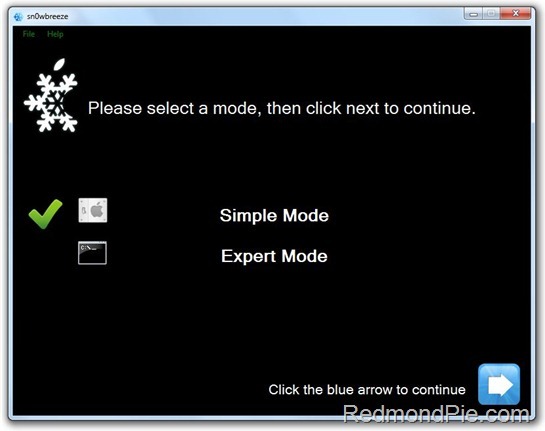 Step 4: Start Sn0wbreeze and select “Simple Mode”. Step 5: Sn0wbreeze will now ask you to browse for your .ipsw file. Select the correct 3.1.3 firmware .ipsw file by clicking the “Browse” button. Sn0wbreeze will verify the selected file and then will present you with following screen. 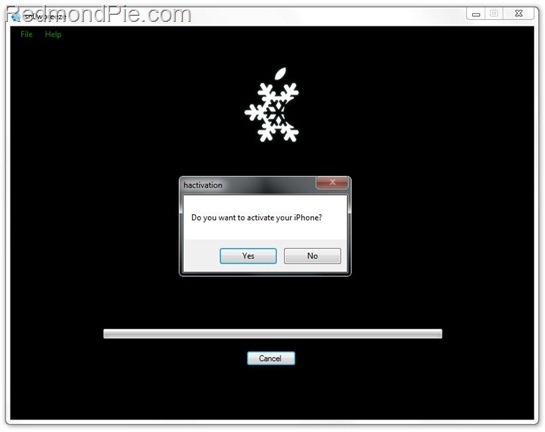 Step 6: Click on "Yes" when Sn0wbreeze asks you “Do you want to activate your iPhone?” for hacktivation. Click on “No” only if you are on an officially supported carrier like AT&T. Step 8: Now you will have to restore your iPhone to this custom firmware 3.1.3 that you just cooked using Sn0wbreeze for your iPhone. Click on your phone from the sidebar in iTunes and then press and hold left “Shift” button on the keyboard and then click on “Restore” (Not “Update” or “Check for Update”) button in the iTunes and then release the “Shift” button. This will make iTunes prompt you to select the location for your custom firmware 3.1.3. Select that custom .ipsw file and click on “Open”. Step 9: Now sit back and enjoy as iTunes does the rest for you. This will involve a series of automated steps. Be patient at this stage and don’t do anything silly. Just wait while iTunes installs the new firmware 3.1.3 on your iPhone. Your iPhone screen at this point will be showing a progress bar indicating installation progress. After the installation is done, iPhone will restart automatically and you should now have a fully jailbroken iPhone running on firmware 3.1.3. You can now follow the tutorial/guide posted here or here to unlock your iPhone 3G and 3GS (old bootrom only) on firmware 3.1.3 using ultrasn0w or blacksn0w respectively. Step 10: Once you are done with the unlocking and jailbreak process. You can now restore all your settings, apps, music, contacts and photos to the newly installed firmware version 3.1.3 by restoring the backup that you made in Step 2 from iTunes. Note for iPhone 3G and 3GS Users (New Bootroms): We strongly suggest that you stay away from this official upgrade until and unless the DevTeam or George Hotz releases new jailbreaking and unlocking tools for 3.1.3 firmware. We will let you know when it will happen. In the meantime you can follow our complete jailbreaking and unlocking guide for iPhone 3.1.2 firmware using blackra1n, PwnageTool, redsn0w, sn0wbreeze, ultrasn0w and blacksn0w. UPDATE 1: Sn0wbreeze 3.1.3 V1.4 is now LIVE for iPhone 2G, 3G, 3GS and iPod touch 1G. More info and download links can be found here. UPDATE 2: PwnageTool 3.1.5 for Mac OS X is now LIVE! Follow our complete step by step guide posted here to jailbreak and unlock iPhone 2G, 3G, 3GS and iPod touch 1G, 2G on iPhone OS 3.1.3. UPDATE 3: Sn0wbreeze 3.1.3-V1.5 is now available, brings support for iPod touch 2G on 3.1.3 firmware. Download it from here. UPDATE 4: Upgraded to iPhone 3.1.3 accidently? Want to downgrade back to iPhone 3.1.2 and unlock? Follow the guide posted here to downgrade iPhone 3.1.3 baseband 05.12.01 with Fuzzyband. UPDATE 5: Sn0wbreeze 3.1.3-V1.5.1 is now available, Download it from here. UPDATE 6: Push Doctor has been released to fix Push Notifications on iPhone 3.1.3 for free. More info on it can be found here. UPDATE 7: Sn0wbreeze V1.5.2 is now available for download. More info here. UPDATE 8: GreenPois0n to Jailbreak iPad and iPhone OS 3.2. More info here. UPDATE 9: Geohot has a working solution for iPhone 3.1.3 / 3.2 on the new baseband and bootrom. Here is a video of it in action. UPDATE 10: Jailbreak iPad with Spirit is Real ! More info here. UPDATE 11: iPhone OS 4 has been announced. Download iPhone OS 4 Beta Developers Preview for iPhone and iPod touch here. Jailbreak iPhone OS 4 Analysis can be found here. UPDATE 12: Jailbreak iPhone OS 4 with Redsn0w 0.9.5 is here. Step by step instructions can be found here. UPDATE 13: Spirit Jailbreak tool has been Released. You can jailbreak all iDevices including iPhone 3G/3GS, iPod touch 2G/3G and iPad on OS 3.2. iPhone unlockers should stay away! P.S. I haven’t tried this method on my iPhone 3GS yet. I will personally wait for other success stories before I give mine a try. ONLY TRY IT AT YOUR OWN RISK. Disclaimer: This guide is for testing & educational purposes only. Follow it on your own risk. I’m not responsible for any loss of important data or malfunctioning of your iPhone. after choosing the .ipsw file a “not a valid IPSW” error appeared… HELP~!!!! Im having problems 🙁 Im running 3.1.3 iPhone 3G and i got through all the steps, till preparing to restore, and it refuses to restore.. now im stuck with a blank phone 🙁 What do i do?? I am new to this, I am trying to buy Iphone4 in China and it does not support the use of Itunes. The Iphone4 comes unlocked. My question is Can I reload the firmware to the one that support the iphone to be use itunes? Or this iphone4 will never work with itunes even after upgrading it with another firmware here. Please advise if this is a wrong move to go for China Iphone4 with the intention of upgrading to firmware here that would support it to work with itunes. Thank you in advance and I look forward to hearing from you guys. This might be a dumb question but where is this custom firmware stored that snowbreeze creates that we are suppose to use when restoring from itunes. Okay, I want to follow these directions on this page. I have the iPhone 2g with 3.1.3. Am I good to go? Also, will this activate the phone. You said to say no if I'm with AT&T which I am. I need it activated. Am I good to go? use the i tunes to restore to whatever you like 3.1.3 or 3.1.2 or any! mine just did the exact same thing…I can't get it to restore with the file I created….help!!! Can you add music to a disconnected Iphone and just use it as an Ipod? If so, how? Apple don’t do warrantys on jailbreaked phones! Ok so I downloaded the OS version that I needed and sn0breeze and i saved both to my desktop. I installed sn0wbreeze and when I go to look for the file that I saved on my desktop it is in an compressed folder so i extracted it too but there is no .ipsw file. There is a folder that says iPhone1,1_3.1.3_7E18_Restore but when I go into that there is not the file I need so I don’t know what to do. Any help? samething happened to me, please help! hi i have jailbreak on my 3g sometime back, but i was careless and upgrade my 3g version to 3.1.3 hence jailbreak was gone. now can i jailbreak again? Is it harmful for iphones which had jailbreak history? THe “patched” IPSW file gets created succesfully, but itunes cannot recover the iphone using it! It gives error 1600. This patch is worthless! I tried to jailbreak my iPhone, when iTunes finished restoring my iPhone to 3.1.3 firmware, redsn0w didn’t recognize dhe same firmware that I’ve installed, so now I can’t use it… there just one option, EMERGENCY CALL! How to jailbreak or connect it with iTunes, because when I connect it I see there the message: NO SIM CARD SUPPORTED! forget all other ways of jailbreaking, this works amazing and is so quick. 5 mins and your done with cydia installed. just launch safari and go there. hey wen r u gonna give the software for new bootrom? I think mine is MC version.. If u people got some software for this please tell mi.. .. I wanted to let you know that I did follow your procedure and manage to j and u but unfortunately even though I back-up all data including settings, apps, music, contacts and photos, I couldn’t restore the apps ! Could you let me know how can I restore my apps into u Apple Iph 3G ? I did a lot of search about your procedure and most of the posts weren’t helpfully b/c people doesn’t tell you enough info fi. what Itune ver should use, what OS (Mac, Windows), what dll you need to have under Common Files /Apple/Mobile Device support, links to download it etc. Btw my Itunes ver is 9.2.1.5.
wtf? phone just went black and would only restore original apple update, i`m using itunes 9.2.1.5 is that why? Appleberry is really expensive, folks dont use it. I used just google atttiphooneuunlocking, I think is better, we never disappointed me.